Rio’s Sambodromo parades are a fantasy of beautiful bodies and dreamlike costumes but the self-declared greatest show on Earth is prepared in a dirty street next to an open sewer. The contrast between what happens inside Rio de Janeiro’s specially built samba stadium and just outside encapsulates the confounding, often tragic contradictions of Brazil. 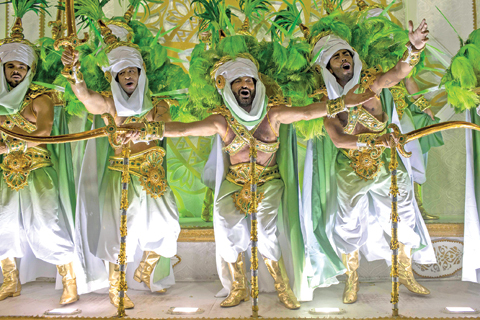 Inside, watched by 70,000 paying fans, the samba schools marched all night Monday into yesterday in a stunning blend of military precision, wild imagination and sexual energy. Avenida Presidente Vargas is where each samba school gathers its approximately 3,500 performers before parading. Final assembly is done to floats, costumes are donned, make-up put on and each wing of dancers and drummers marshaled into position. The avenue is drab and lined with graffiti. An imposing building, once a teaching hospital, sits abandoned and partly gutted, the faded sign at the entrance still reading: “Serving the community.” During the days of carnival, the street is temporarily transformed, thronged with bizarre costumes, and pulsating with joyful music. Late Sunday, African warriors came running by, a section of men dressed as knives and forks shuffled to the side, and three leggy women fiddled with their tiny, sparkling substitutes for underwear. An enormous man dressed as an emperor of some kind scrolled through his cellphone. Behind the performers, many of whom sat on the ground alongside their ungainly costumes, waited the crazy floats-a seahorse as big as a bus, a herd of golden camels, an entire Arab palace. It would have been momentarily easy to forget reality if it hadn’t been for the combined smell of the canal, the portable toilets and gutters filled with urine and beer. City authorities say that carnival brings about $1 billion in extra revenue to Rio. That wealth clearly doesn’t go toward facilities for the Sambodromo’s makeshift backstage, let alone installing a sewage system in neighborhoods around the stadium. Still, a little wealth trickles down to the poor. Jonathan Torres Ribeira, who says he’s been collecting aluminum cans from the street since he was a child, does well at parade time. The revelers litter Avenida Presidente Vargas with beer and Coke cans, so the 23-year-old soon fills a large plastic bag. With 24 hours’ work, he says, he’ll make about 500 reais ($160) — 10 times more than he would on a normal day. people who want to watch the samba schools set off down the avenue before turning into the Sambodromo. Elaine Pereira da Costa, 60, shook her head sadly when asked how the same city could feature such splendor and squalor within touching distance of each other.